Learn about the campus’ history and architecture and explore the campus that might have been. In honor of the University of Michigan’s bicentennial, we highlight the U-M Ann Arbor campus, both before its creation and throughout its continuous evolution. Depicting the Ann Arbor area before the establishment of the city, the exhibit celebrates the Native American community and highlights its presence throughout the decades. 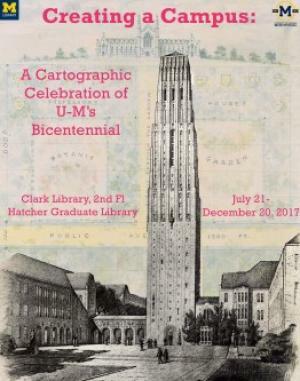 Featuring the work of famous architects such as Alexander Jackson Davis, Albert Kahn and Eero Saarinen, the exhibit presents maps, plans, architectural drawings, proposals, and photographs of the campus throughout its evolution. The Library will be closed December 23 to January 1.